Here we are highlighting the top eight jobs where demand exists for high skilled workers in Canada in 2018. Additionally, we have a comparison of the most popular occupations in the market and have put a focus on the occupations of candidates which have been approved in the Express Entry system in the past. A good Sales Representative is an asset to a successful business. Skilled workers doing this job have a huge demand in Canada. Presently, there are 8,632 vacancies for it in the Canada Job Bank. In this category, the Business to a customer, and business to business jobs, has been included. The basic salary is $64,000 and it also has commission incentives. When there is a big business, there is a demand for the Accountants. This job is also having a big demand in Canada. Advising clients regarding their tax compliance is very important in this job. Moreover, it helps businesses and single persons in managing their finances. A Chartered Professional Accountant can get a steady employment in the country. This job will continue in the future also. Many construction projects are running smoothly because there is an Engineering Project Manager with rich experience. In Canada, there is a huge demand for such jobs. Presently, there is a big housing market and there is a plan of the federal government to implement infrastructure projects. A Business Analyst is in charge of running the business smoothly and efficiently. He/she has many technical skills and financial acumen. Large operations are using the services of many analysts in different business areas. IT Project Manager has the responsibility of managing time and staff. Moreover, he/she must have sufficient technical skills and work in the budget of the project efficiently. They must be looking to complete complicated technology projects and help in the growth of the business. Salary range: $92,000 -$114,000 having 1,989 vacancies today. This is the detail of the statistics under the Canada immigration system and has the top occupations of applicants who have been invited to apply for permanent residence in 2017. It has professional occupations in natural and applied sciences. 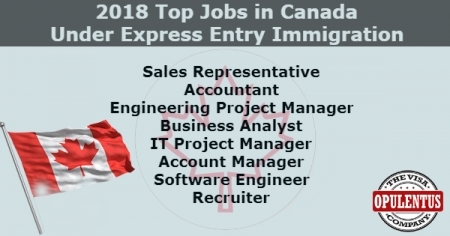 Top 2017 Express Entry jobs by proposed Occupation. Total Admission Through Express Entry in 2017 65,415.